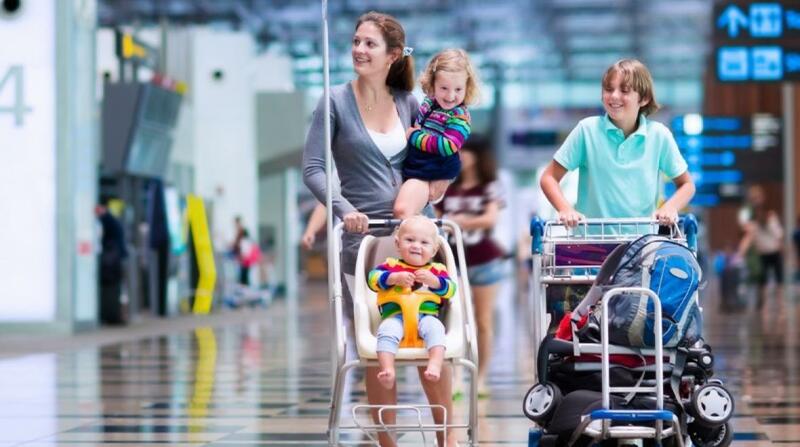 The busy holiday season is here and our thoughts are turned to family travel! If you and your little ones have plans to hit the road, sky or water anytime soon, be sure to check out this excellent travel gear. From car seat carriers to travel trays, we’ve got options to keep your travels (almost) hassle-free and full of fun! The award-winning Ergo carrier has been a lifesaver (not to mention back-saver) for parents; supporting your baby the way you would naturally while distributing weight evenly across shoulders and hips. Made of 100 percent breathable cotton, the Ergo is versatile and can be worn in the front, back or hip position, letting mom or dad be hands-free. Check out Ergo’s different collections, from organic to travel. Combine with an Ergo travel pouch. Why we love it: With kids and/or babies in tow, hands-free is always a good thing. 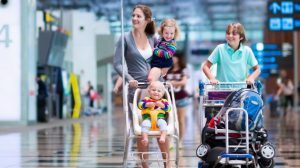 Whether you’re playing jet-setter with your toddler, exploring streets of a new city or on a road trip that requires lots of pit stops, having an umbrella stroller makes for quick, easy mobility. The UPPAbaby G-Lite is the big (little) stroller that’s got lots of features, including a removable cup holder, washable soft padded seat, extra sunshade and tall, ergonomic handles dads will no doubt appreciate. Hand-operating triggers save you from any fancy footwork, and the shoulder strap is indispensable for travel. More than a bag, this deluxe carrier case features thick padding on all sides to protect your child’s car seat. The water-resistant, heavy-duty fabric cleans easily and protects the interior from moisture. Best part? Go hands-free and wear it as a backpack! Tip: The bag is large enough to stuff in an extra booster seat, clothes, diapers, etc. Referred to as the “washable, squashable high chair,” this soft harness attaches securely to an adult chair while snuggly enveloping your baby. Perfect for travel, it can be rolled up and popped into a purse or diaper bag. Guava Family’s Lotus Everywhere Crib is getting rave reviews from parent travelers. It’s light, extremely portable, and sets up in 15 seconds (no joke!). When packed, it converts to a backpack that qualifies as a carry-on (for most airlines), so it’s great for airport layovers. Why we love it: There’s a side door that can be zipped and secured, improving the “crib” experience for your child. It’s also great for when you want to soothe your child to sleep but don’t want to hang over the railing. For kiddos who have transitioned into “big kid beds” (and for parents who want to keep it that way), the Shrunks Tuckaire travel bed can be a great option. Completely non-toxic, it’s designed so that any sized sheet can tuck into the inner mattress, and the Jetaire electric pump makes for quick inflation and deflation.